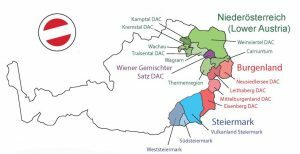 Though well-known for its skiing in the Alps, Austria is increasingly becoming known for its quality wine regions in the warmer north east region of the country. It has one of the most innovative and dynamic wine industries in Europe. 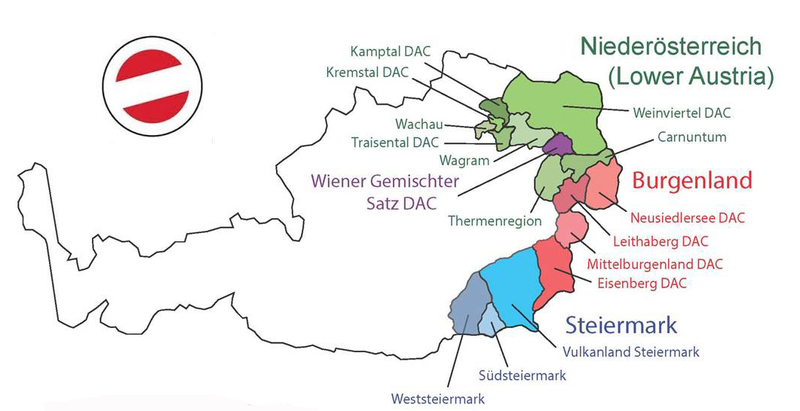 Only 35 grape varieties are permitted to be grown in the country, which focusses mainly on whites made from Gruner Veltliner and Riesling as well as reds made from Blaufrankisch, Zweigelt and, Saint-Laurent Gruner Veltliner is considered the country's signature grape variety, which is typically produced in a crisp, spicy style. Classic wines show citrus aromas (lemon peel and grapefruit) complemented by fresh vegetal notes and the variety's trademark hint of white pepper. 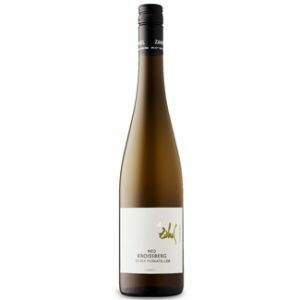 Pale lemon colour; intense elderberry fruit with grapey nutmeg notes; palate is dry with refreshing acidity, some phenolic texture on the palate with a long fruity finish.